A new poll in New Hampshire puts former Massachusetts Governor Mitt Romney leading the race for the Republican presidential nomination. The trouble is, Romney isn't running and says he doesn't plan on it. "I am voting for Donald Trump no question about it," said Manchester resident John Ball. That is, until we mentioned Romney's name. "I would vote for him in a minute," Ball said. "I like the guy." If former Massachusetts Governor Mitt Romney launched a third run for president, he'd pull Ball's support from Trump. "He's trustworthy, he's a businessman, I would have voted for him last time in a heartbeat," Ball said about Romney. Another Manchester resident Gary Vieira agreed with Ball, saying, "He's got a bit more experience than the rest, is he ran I would probably go in his favor." These folks at Manchester's Airport Diner represent many other Republican voters in the state. According to a new Suffolk University/Boston Globe poll, 30 percent of Republican primary voters in New Hampshire would back Romney if he threw his hat in the ring. "He's taking away votes from Jeb Bush and Marco Rubio and he takes away significant support from Donald Trump," explained political analyst Scott Spradling. 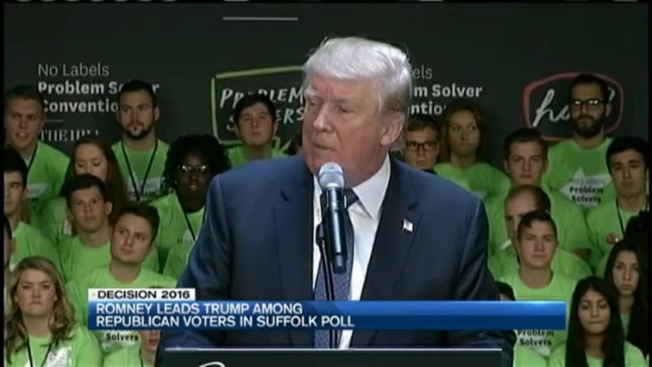 Spradling says this poll that shows Romney with a double-digit lead over front-runner Donald Trump, could be indicative of trouble for the Republican party. "You look at the level of dissatisfaction among voters, to you that might say these are people who are not going to turn out next November, this is great for Democrats, I think you can make that argument," Spradling said. He also says it reinforces the idea that first in the nation primary voters are notorious for waiting until the last minute to make a decision. Voters we spoke with prove his point. "I want to wait a little longer," said Rose Marie Tremblay of Bedford. "There is still a lot of time." "They're going to make up their minds the day they vote," Ball said. Romney reiterated as early as last week, he's not running for president. Even if he did, he missed the New Hampshire Primary filing deadline and would have to run as a write-in candidate, something analysts say hasn't been done this century.